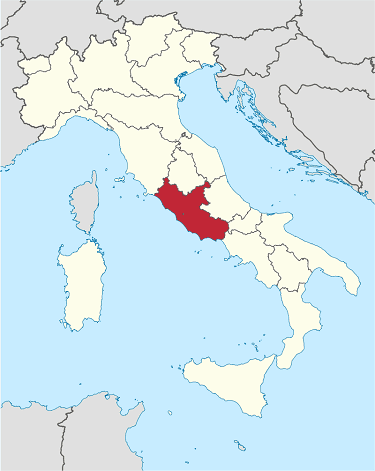 Italy’s Lazio region is located in central Italy. The region of Lazio borders Tuscany, Umbria, and Marche to the north, Abruzzo and Molise to the east, Campania to the south, and the Tyrrhenian Sea to the west. The region is mainly flat and hilly, with small mountainous areas in the most eastern and southern districts. Lazio sightseeing is most famous for the Eternal City Rome. Watch the video below for more about sightseeing in Lazio. Rome, Italy’s capital and the largest city in Italy, is located along the Tiber River. Inside Rome the sovereign state Vatican City is one of the most popular Italy vacation destinations. Click here for Rome sightseeing tours and activities. Italian cruises leave from Civitavecchia cruise port on Lazio’s Mediterranean coast. Ostia Antica is the ancient Roman port, located a few minutes from Civitavecchia is also a popular Italy sightseeing destination in Lazio. Families with children studying history always find Ostia Antica very interesting. And because it was not destroyed like Pompeii there is much to see. The Mediterranean coast is full of well-preserved buildings from ancient Rome. Before the Romans the Etruscans inhabited this area. You’ll find excavations from the Etruscan area along Lazio’s Mediterranean Coast, which is often called the Etruscan Coast. South of Rome Tivoli Gardens, Hadrian’s Villa, and Villa de Este, are popular sightseeing destinations for those who like gardens and are interested in ancient Rome. Fiuggi and Gaeta are other interesting south of Rome Lazio destinations. In the mountains of Lazio outside Rome is Fiuggi and the Pope’s summer home Castel Gandolfo. For those looking for Medieval history and even thermal spas be sure to check out Viterbo. For more information about Italy vacations to Rome click here.